General Hospital (GH) spoilers for the week of December 10-14 tease that we’ll see some letdowns and fireworks. First, let’s talk about Nina (Michelle Stafford). She’ll face some disappointing updates, so this may be about Sasha’s (Sofia Mattsson) desire to leave town. Nina may worry that she won’t be able to talk Sasha out of it, but Valentin (James Patrick Stuart) might offer enough money to keep her around. Regardless, Valentin will keep up his efforts to reunite with Nina. Someone will encourage Nina to make that reunion happen, which might be Sasha as well. She’ll do whatever she’s told for the cash and she seems to be rooting for the duo anyway. Meanwhile, Ava (Maura West) will struggle with anger and sorrow. She’ll sink into a deep, bitter depression as she processes her loss. 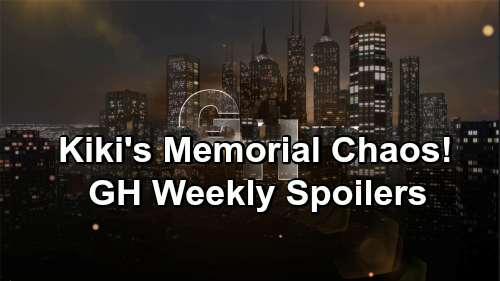 General Hospital spoilers say a shocking visitor will appear later. He or she will catch Ava off guard, so we’ll see if this visit has a positive or negative effect. Over with Carly (Laura Wright), she’ll stop by the cemetery and speak to Morgan (Bryan Craig) as his grave. Kiki’s death will open some old wounds, so Carly will need a moment to work through them. At Kiki’s memorial service, chaos will be unleashed. General Hospital spoilers say Carly will manage to provoke Ava’s wrath. She probably won’t mean to, but that won’t matter to Ava. GH fans can expect Ava to go off in a big way. She’ll have a crazy meltdown in front of all Kiki’s family and friends. Julian (William deVry) will also face a tricky situation in the week ahead. He won’t want to be pushy, so he may step back a bit when it comes to Kim (Tamara Braun). It’s clear that Drew (Billy Miller) and Kim have a lot on their minds right now. Oscar’s (Garren Stitt) feeling rough thanks to that clinical trial and things should get worse before they get better. Julian might think he needs to let them handle this as parents and back off. Kim and Drew will indeed stick together as they tackle the crisis. Across town, Anna (Finola Hughes) will feel like her future with Finn (Michael Easton) is bright. She’ll have high hopes as any previous issues continue to melt away. Finn’s issues with Chase (Joshua Swickard) will keep melting away, too. They’ll strengthen their bond as brothers this week, so GH viewers should see some sweet scenes. Elsewhere, Sam’s (Kelly Monaco) curiosity will intensify. Her head may end up spinning from some new leads in the Leland Powell drama. Other General Hospital spoilers say Willow (Katelyn MacMullen) is in for a shock. This could involve her competitive love interests, Chase and Michael (Chad Duell). Finally, Carly will take a stand against “Kevin” aka Ryan (Jon Lindtrom). He won’t appreciate her harsh words, so she’d better watch her back! It sounds like some exciting episodes are coming up. We’ll keep you posted as other GH news emerges. Stay tuned to the ABC soap and don’t forget to check CDL often for the latest General Hospital spoilers, updates and news. General Hospital Spoilers: Nelle Betrays Brad, Imprisoned Schemer Tips Off Michael – Blows Up Baby Swap Drama?